This high-quality, diamond-coated sharpening bar ensures long life and clean and easy sharpening. The two different forms of the two components allow individual sharpening with each side. The oval side is for sharpening the complete blade of a hoof knife. The finer, round side is for sharpening the bow and the flute of a hoof knife. This simple sharpening solution can be inserted into electric drills and die grinders up to a maximum speed of 20,000 rpm. Move the grinding stick along the cutting edge and curve with gentle pressure. The use of machinery and the high-quality diamond coating cut the time needed for the resharpening process considerably. This sharpening tool is also suitable for other cutting tools. For hoof knives and other sharpening tools. Just right for the pockets of anglers, hunters and campers; also suitable as a gift. For hoof knives and other cutting tools, flat oval-shaped. 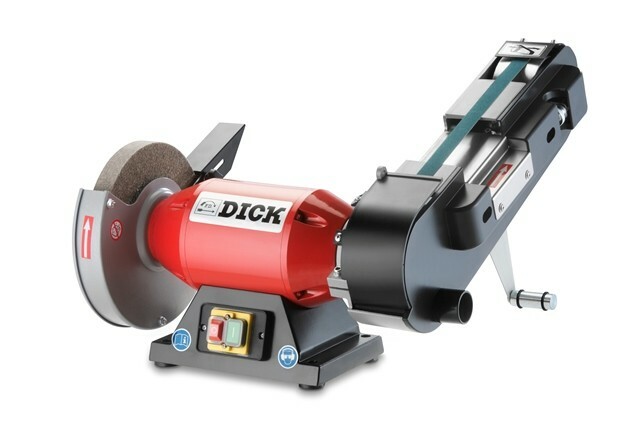 The rapid and gentle alternative to conventional grinding of all types of knives, toeing knives and horse shoes. The powerful machine has two standard abrasive belts (small and wide, grain120 und grain150) and a felt polishing disk. Grinding and polishing is possible up to the tool handle. Stepless and individual movable grinding arm. The silent running machine has a firm stand and due to the compact design also be suited for the application in service cars.